Tracking customers in real-time, zero-click ordering and delivering pizzas via artificially intelligent robots are just some of the latest innovations underway at Domino’s. The pizza retailer today launched the first in a proposed series of tech innovation events, under the brand ‘Abacus’, showcasing the way digital and technology is being harnessed by the business. Ten innovations were detailed, some of which will be available from next week, while others will be rolled out over the coming 12-24 months.All stemmed from the theme ‘time is the enemy of food’ and showed the power of harnessing data analytics not only for operational process improvements, but also for tailoring customer experiences and interaction. The first of these is On-Time Cooking, an extension of the GPS Driver Tracker capabilities Domino’s has been providing for the last 10 years aimed at shortening the time between cooking a pizza and when customers pick up their order. Domino’s A/NZ managing director, Don Meij, said that until now, stores haven’t known exactly when a customer will arrive, running the risk of pizzas sitting on the rack for 10 or 20 minutes longer than they should. Between 50 and 60 per cent of customers are picking up their orders in-store nationally. By turning the capabilities of GPS Driver Tracker on the customer, Domino’s can now work out exactly when a customer is due to arrive in store in real-time, and cook their order accordingly. This will be based on when a customer enters a pre-determined ‘cooking zone’ around the radius of the store, and the method of transport they’re using. Domino’s chief digital officer, Michael Gillespie, said tracking will be undertaken in two ways and is based on a customer’s consent. For those that order using their mobile phone or who choose to be tracked via their mobile device, Domino’s will be able to determine their exact location and adjust cooking times accordingly. For those ordering via a desktop PC or who do not want to be tracked, Domino’s will use algorithms and data around the customer’s location and method of transport to determine an appropriate cooking time. In addition, Domino’s can send an SMS to the customer as soon as a pizza is in the oven. Gillespie stressed customer privacy and consent was paramount in providing On-Time Cooking, and said data would only be used for that experience at that by in time. On-Time Cooking is being launched as an embedded capability in all ordering platforms from 13 June and will be supported by TV advertising. Another local innovation being rolled out is zero-click ordering, available through a new mobile app. Once a user opens the app, they are given 10 seconds in which to cancel or modify an order before one is processed by Domino’s. These could be based either on a favourite pizza or the most recent order. Domino’s has also updated its customer interface by integrating pizza tracker functionality into its existing driver tracker screenview. Another improvement in pizza tracker is more accurate estimated delivery times, made possible through a combination of GPS Driver Tracker data, Pizza Tracker and store operational data points, Gillespie said. Data is again behind Domino’s targeted communications activity, aimed at providing customers with more relevant discounts and offers aimed at encouraging them to try new products or upsell their orders. What GPS driver tracker has also done is give Domino’s a platform in which to interact with customers in real-time. One of these is through real-time polls, which customers can participate in while they’re waiting for their pizza to arrive. From questions on whether customer prefer pineapple on pizzas or if they’d answer the door in their pyjamas, Domino’s has since evolved to asking about social and political matters, such as who is going to win the Australian election come July. Gillespie pointed out Domino’s digital innovations are being rolled out across all of the countries it operates in under its One Digital Global approach. This is opening up more customer feedback and data sets that help refine and improve and customise the applications and services on offer, he said. Digital systems developed in Australia are now in four other markets - The Netherlands, Belgium, France, New Zealand – and will be rolled out in Japan and Germany soon. 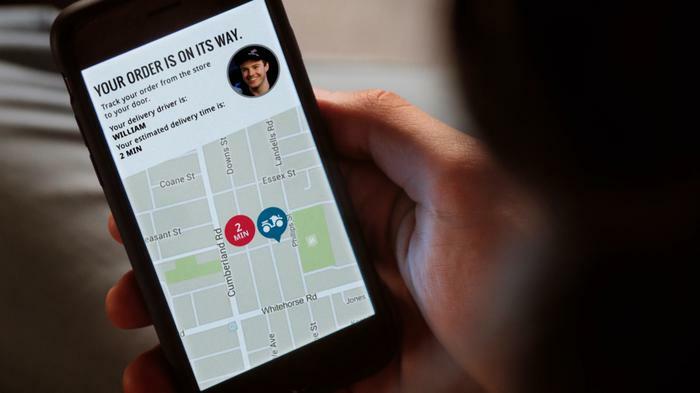 To meet the more restrictive privacy regulations in Europe, Domino’s has put together a new version of its driver tracker offering which leaves out the driver and map specifics provided in the app in A/NZ but includes delivery information. 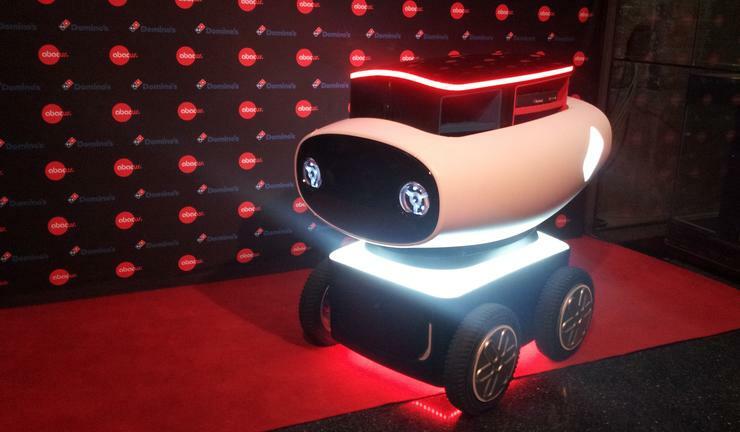 Arguably, the most futuristic of Domino’s innovations is its DRU robot, which stands for Domino’s robotic cart, which debuted in March. The robotic deliveryman was delivered in partnership with local robotics house, Marathon Robotics, and has been trialled in Brisbane. It’s expected to then rollout to New Zealand. Meij said DRU is one piece of a bigger initiative to utilise robotics and artificial intelligence, technology innovation he suggested was inevitable. But rather than a horde of DRUs on Sydney streets, the first experience customers are likely to have with this technology is as a voice-activated virtual assistant through digital ordering platforms. The local idea has been inspired by the US virtual assistant, Dom. “The future very much is voice and we’ll be in our homes talking, rather than using a device,” Meij claimed. “We can engage while doing other things, especially in the safety of our car. Some of the hardest things on our platform, such as digital wallets or loading credit cards, can be seamless and easier to you. Another ambitious and long-term project is Project 3/10, an initiative aimed at cutting down delivery times from the traditional 30-minute window to just 10 minutes. Again, Meij said this is being made possible through a combination of more accurate data-driven insights into cook, rank and hustle times related to producing and delivering an order, which he claimed should save minutes along the way. Project 3/10 has also seen Domino’s invest in new ovens that cut cooking times from 7 minutes to four minutes, and Meij said further over improvements proposed will bring this down to 3 minutes long-term. So far, 68 stores have been enabled to deliver in 10 minutes, although Meij expected it would take at least two years before all stores across A/NZ would be able to achieve 10-minute delivery. The average time nationally for Domino’s is currently 22 minutes in Australia and 21 minutes in New Zealand, while stores enabled already with Project 3/10 are averaging between 10 and 18 minutes.